Soorya Namaskar has its origin in the 'Rig-Veda'. The presence of such effective ways of maintaining one's health from such an ancient time shows that Rishis (Vedic Scholars) must have spent innumerable years, studying various aspects of the human body like anatomy, circulatory system, digestion of food, respiratory system, nervous system, stimulatory networks and impulses. They must have done experiments to devise various strategies which would help a human being lead a healthy and peaceful life. Soorya Namaskar helps the to develop a body which is strong, capable of working hard and facing hazards in life. It helps in controlling one's mind which is unstable by nature and helps the mind to concentrate on the task at hand. By performing sooryanamaskar, one can exercise various muscles of the body, expend tremendous amount of energy and feel refreshed and energetic at the same time. This helps a student in his/her studies, games and in developing physical fitness. Working individuals can develop sufficient stamina to work with ease and efficiency. Soorya Namaskar has been practiced all over India for several thousand years. Minor changes have been adapted in different states but the main framework and the philosophy remained the same. The history of Soorya Namaskar from 1600 AD to 2006 AD makes an interesting study. It covers the evolution of this ancient practice through the period of Mughal Rule, Maratha Dynasty, British Rule and nearly sixty years of Independence. Samarth Ramdas Swami, during the Chhatrapati Shivaji Maharaja's regime, built a network of Maruti Temples (Maruti is the God of Physical and Moral Strength) and gymnasiums to build a generation of youth, with excellent physical fitness, high character and love for the Nation. Soorya Namaskar formed an important part in Gymnasium training. This practice was also continued in the Peshva regime. However progress was slowed down during British Rule. British Rule changed the educational pattern of India. English language was introduced and was used as the medium of instruction for education. Although Degrees and Diplomas from various colleges produced a white collar class, a large segment of the population remained as working class. Traditional Indian education however continued to survive in certain pockets of India, especially in the princely states administered by Indian Kings and Queens. Of these many kingdoms, it is on record that Kings of Aundh (Maharashtra) and Baroda (Gujrath) took special interest in promoting Soorya Namaskar and other Indian exercises like Malla-khamb and Wrestling and introduced them as a part of School education. The tradition continued even after the princely states were merged into independent India. In Maharashtra, practically all the schools trained students in drill, Indian games and Soorya Namaskar. However, after 1960, these activities remained restricted to a limited group of students and were not widely popular for a variety of reasons. Recently, the instruction of Soorya Namaskar in schools is making a comeback with the state governments of the states of Gujarath, Madhya Pradesh and Karnataka states contemplating introducing it as a part of school education. The benefits of Surya Namaskaar are enormous. It revitalises the body and mind. 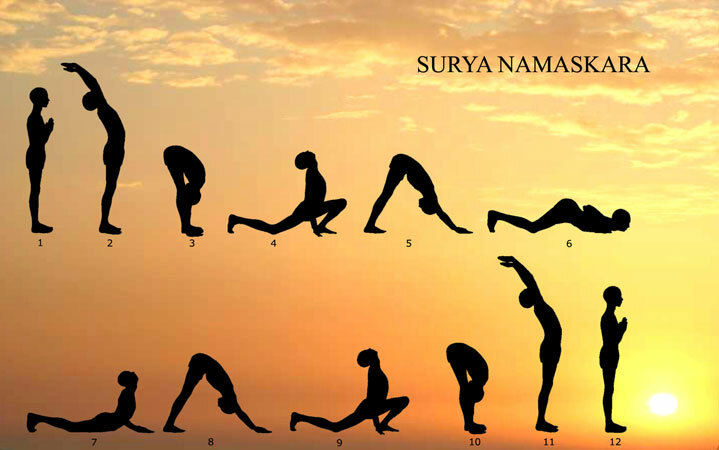 Disorders of the eye, nervous system, digestive system and lungs disappear within a month of regular Surya Namaskaar. The exercise also helps one attain longevity and casts a healthy glow on the face of the practitioner. It is also worth noting that Soorynamaskar may improve health by affecting many more biological phenomena involving the liver, stomach, kidneys, heart, brain, nervous system, secretion of hormones from glands situated at various centres in the human body, utilization of glucose, adenosine-di-phosphate and triphosphate, and triglycerides. Android Obesity as well as Gynecoid obesity can be controlled by performing Soorya Namaskar exercise. It is a holistic exercise to one and all as it can be performed from childhood to old age. Devotion is another feature of this multifaceted exercise. Humble attitude is inculcated in the person who performs this exercise with full devotion. Work done by Dr. Howard D. Stagel in 1990 showed that the sound frequencies generated by Aumkar and Gayatri Mantra are in the range 210,000 cycles per second. A study by the Defence Ministry of India has shown positive cardiovascular effects of Soorya Namaskar on the participants. Preliminary tests done by Dr. Teh of Singapore Sports Council in collaboration with Dr. Pavan Kohli, Orthopedic Surgeon and Sports Medicine specialist, Pune (India) have shown a high calorie expenditure during the performance of Soorya Namaskar. This led to the introduction of Soorya Namaskar in some of the training centres of Singapore Sports Council, during the warm up and cool down phases during Sports training. Plans for a full-fledged research on Soorya Namaskar are underway in these centres. In addition, various other institutions are undertaking studies to monitor the effects of Soorya Namaskar on obesity, pulmonary system and muscle development. According to Modern Sports Science, Soorya Namaskar is beneficial at various levels like, Kinesiology (Science of movement), 'Core Stability', Flexibility' and achieving a state of 'Zone' or 'Flow State' (A state of timelessness). Surprisingly, persons performing Soorya Namaskars can experience and enjoy these concepts without any special training. This unique feature of Soorya Namaskar is aptly described in Reader's digest, May 2007 on pp. 220. Take some rest after doing the twelve rounds. The stomach should be empty. Ifone is used to having a cup of tea or coffee in the morning, the exercise should be started after half an hour. Food should be consumed only after one hour of completion of exercise. Diet suitable to one's taste and age should be chosen. Overeating should be avoided. Nature's calls should be attended without delay. If you are suffering from a serious illness or disorder, consult a doctor or a yoga expert before starting Surya Namaskaar. Wearing tight fitting clothes and shoes should be avoided. Shorts and a loose T-shirt or any comfortable attire can be worn. The body movement and transition from one position to other should be smooth and not sudden or jerky. Ladies should avoid this exercise during menstruation and pregnancy (from 4th month till delivery and six months after delivery).